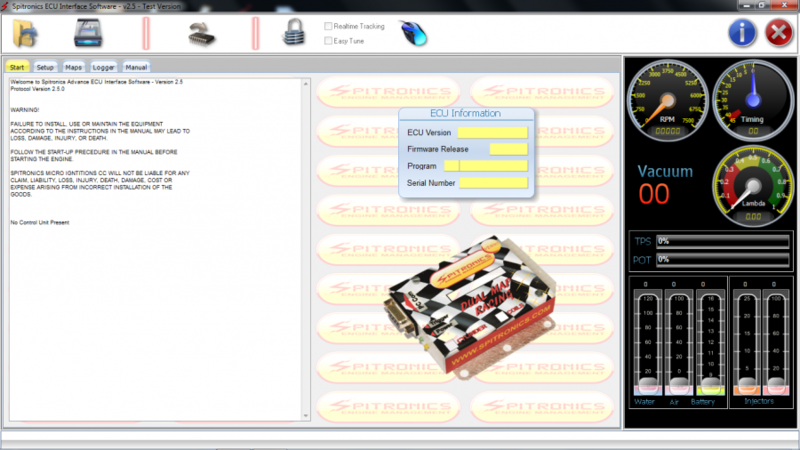 We specialize in Spitronics ECU & TCU Tuning while you wait, if all your sensors are connected we can tune the system. This skill was developed and refined on things we learned about the software while Dyno tuning vehicles and attending Spitronics training courses, understanding the software is one thing setting it correct on a engine is another. The Spitronics units is very advanced and with the right tuning you can get very good results on fuel economy as well as performance. We usually do some basic tinning and then let the client drive his own vehicle while we do some more tuning, the advantage we have on this type of tinning is that you will experience immediate improvement on this type of tinning. We can also pick up Detonation as well as other problems like flat spots and gear change over ect that one can not pick up on a Dyno. The chances of breaking the engine or prop shaft like stuff that happens on Dyno machines is also eliminated because we don't need the high Rpm ranges and strain on the Drive train. We are very success full with this type of tuning and has great Spitronics support and a huge success in tuning the Lexus V8 Auto gearbox TCU systems of the Spitronics units. Rates starts at R650-00 per Spitronic unit.